Lightning is an amazing natural phenomenon that scientists are still trying to figure out. With bolt temperatures hotter than the sun’s surface and voltages sometimes greater than 100 million volts, lightning is one of the most dangerous and deadly forces on the earth. This being said, it’s not surprising that lightning has the ability to do major damage to any home that it strikes. It’s important to know ahead of time what to do if your house does get struck by lightning. Knowing what immediate steps to take in a lightning emergency could save you a lot of money and possibly even your life. A lot of debate surrounds the topic of exactly how lightning is generated. However, scientists agree on the basics: Positive and negative charges separate inside clouds; positive charges move upward, and negative charges move toward the lower portion of the cloud. When enough negative charges build up near the bottom of a cloud, they attempt to reach the positively-charged earth as quickly as possible. If your home ever gets struck by lightning, you will hear a very loud, powerful boom that might shake your entire house. Many homes are built to withstand lightning strikes without succumbing to major damage. This is the purpose of lightning rods; lightning wants to get from the cloud to the ground as quickly as possible, and lightning rods facilitate that journey, providing the fastest route. While staying inside your home, away from doors and windows, is the safest place to be during a storm, a couple of dangers exist inside the home when lightning is involved, regardless of whether you have lightning protection in place. Power Surges: When lightning strikes a house, the electricity often surges through a home’s wiring or plumbing system, searching for the quickest possible route to the ground. Make sure to unplug any electronics (especially valuable ones like TVs or computers), or they could be destroyed. Avoid running water during a lightning storm. You could get electrocuted if you are touching or standing near water or any electronics that are plugged into walls. Fire: When lightning shoots through a home, there’s a risk for fire. The most common place for a fire to ignite is in the attic, when a lighting bolt comes through the roof or top of the house. However, the heat from the electricity of a lightning bolt that runs through the walls inside your plumbing or wiring could start a fire as well. You may notice it immediately, or it may burn slowly inside the walls without your realizing it for some time. First, make sure everyone is okay. If you see fire or smell smoke, evacuate your home immediately. Call 911, and tell them your home was struck by lightning. Do this regardless of whether or not you detect a fire hazard. The fire department will come out to your property and assess the area for damage, including using thermal imaging cameras to search inside walls for heat that could or already has started a fire. Once your home is assessed and found to be safe, you will be able to return inside. Call your insurance company and explain what has happened. Call a trustworthy electrician to come out and inspect your home wiring. 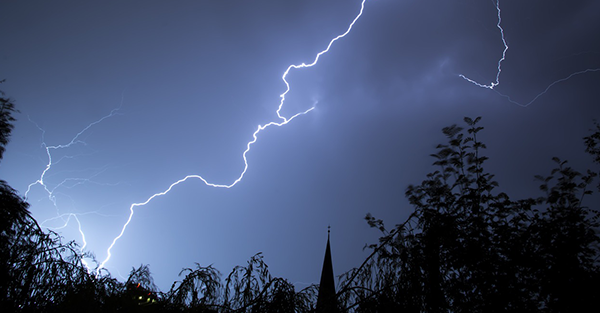 If lightning strikes your home directly, it may damage roofing materials and/or your attic. If you need an emergency roofing repair after a big storm this spring or summer, contact us right away! The sooner you act, the better. Whether it’s a small hole in the roof, damaged shingles, or major fire damage, Hedrick Construction can take care of your emergency roofing needs promptly and skillfully! We provide expert roofing services for residential and commercial properties throughout Ames, Ankeny, Huxley, and the rest of Story County. Contact us today for all your roofing needs!